Gin Blanco is a retired assassin and the owner of a grease hole called the Pork Pit. Just when she thought life was slowing down a couple of jerks tried to rob her restaurant and then someone shoots it up. Thinking someone is out to get her, she straps her gear back on determined to protect what’s hers. Only the killers aren’t after her. They are after a young girl seeking her help. The former killer agrees to help the girl and her grandfather which brings her into contact with Detective Donovan Caine, a man set on ignoring his attraction for Gin. Especially after she enlightened him to the fact that it was her who killed his former partner. With her elemental power and magic, a couple of friends and allies and the detective’s aid, Gin will show the town of Ashland she is not a woman to be trifled with. 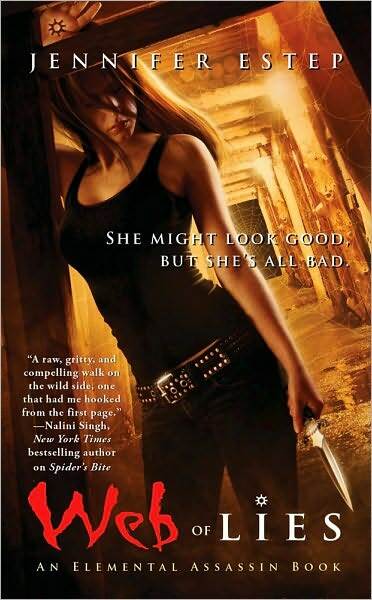 In book one, Spider’s Bite, Jennifer Estep introduces the cold blooded killer Gin Blanco. By the time Web of Lies begins, Gin has settled into the quiet life of retirement with dreams of spending time with Detective Caine. Caine, the only honest detective in Ashland’s police department, never really took to the idea of getting with Gin. Their morals are slightly different. Well, the fact that Gin is willing to get her hands dirty in order to protect people and Caine’s traditional morals prevent him from veering away from the legal norms offer a lot of ground which neither is willing to cross. I hate Caine. I understand Gin’s attraction to him and the semblance of a normal life he represents. But his unwillingness to bend and his cruel words to her, show he is not worthy of her. The mystery into Gin’s past gets clearer in Web of Lies and the action heats up. Estep also introduces a few new characters forcing me wonder where she is taking the elemental assassin series. The ending was exceptionally well written, as I’m on the verge of freaking out cause I have a few weeks until the third installment Venom is released. (It releases on Sept. 28, 2010). If you are looking for a strong woman who dreams of a better life, but knows how to live in the present pick up Web of Lies. You’ll find romance, drama, action and urban fantasy at its finest.